Tween Tuesday is a weekly meme I created to highlight great reads for tweens! 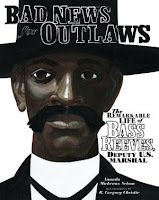 About the Book: Bass Reeves was a former slave who became a U.S. Deputy Marshal. He worked hard bringing in criminals and was respected and feared for three decades. His story may sound like a tall tale, but this is the life of Bass Reeves. GreenBeanTeenQueen Says: Bad News for Outlaws is this year's Coretta Scott King Author Award winner. I'm so glad it won because not only do I think this book is incredibly deserving, but I'm not sure I would have come across it otherwise. I don't know if I can express how much I loved this book. It's a picture book biography, but I think the subject and text make it perfect for tweens who might not typically be interested in non-fiction. It could also make a great introduction to biographies, as it really does read like a tall tale. Vaunda Micheaux Nelson captures the voice of the old west perfectly and it was so wonderfully written. Ms. Nelson also includes many "western words" and includes a glossary of terms that readers might not recognize. I think this adds to the authenticity of the text. Bad News for Outlaws very much reads as though someone has just told you "come sit by the fire and I'll tell you a tale"-there is a distinct narrator throughout and I could hear that narrator in my head while reading. Give this one to readers looking for a good hero story-they'll be thrilled. And I'm sure they'll add Bass Reeves to their hero list like I have after reading. Post your own Tween Tuesday in the Mister Linky! Sarah, I LOVE that you've started up Tween Tuesday, and am totally planning on getting involved (as soon as I can get around to it!). I just finished The Mostly True Adventures of Homer P. Figg and it's ripe for a Tween Tuesday review. Maybe later today!...or maybe next week! I loved this book! One I know I would have passed me by without an award. Hoping to join in the fun of Tween Tuesday next week, since I am finishing up Emmy and the Incredible Shrinking Rat. I can't access Mr. Linky from school but here is my link for my Tween Tuesday...Thanks Sarah!!! Ha ha forgot the link!!! My Tween Tuesday link is up at Mr. Linky. I also started a Kid Lit Mondays for books that are too young for tweens. Check it out here. Thanks for starting this Sarah! I look forward to it every week. Looks like a really good book. I am sure tweens would find it interesting .